What Collins didn’t say at the hearing was that he has a financial stake in the issue: He co-founded a company that makes components for those tests. And he retains an ownership stake in that company, an asset he values at between $5 million and $25 million. Welcome to Congress, where such arrangements are legal — and to many critics, deeply disturbing. 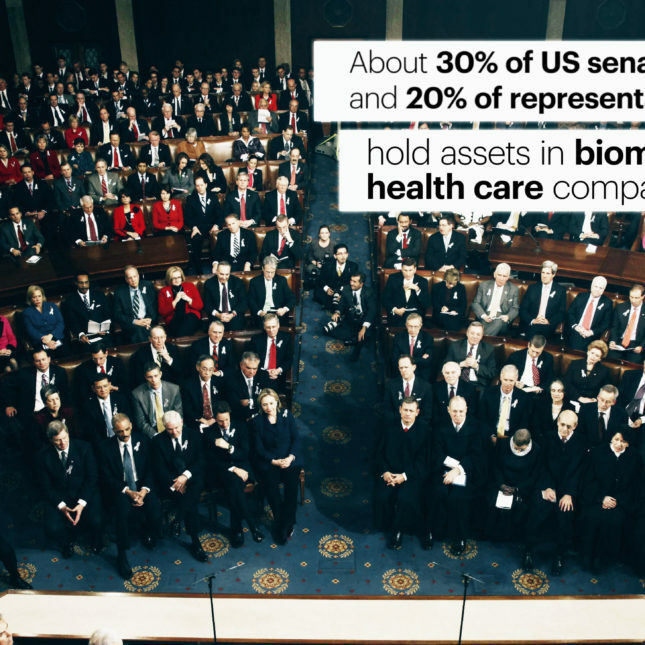 A STAT analysis of thousands of pages of congressional disclosure forms found that about 30 percent of senators and 20 percent of representatives held assets in biomedical and health-care companies, or in specialty funds set up to invest in those industries, during 2014. The most common investments in the House were Pfizer, Johnson & Johnson, Merck, and Abbott Laboratories. In the Senate, investors favored Johnson & Johnson, Pfizer, and Merck. Members of Congress owned more stock in health-related companies last year than in the defense and construction sectors combined, according to the Center for Responsive Politics. Their investments in the sector topped $68 million. Some of the most aggressive congressional investors in the biomedical sector also sit on key committees, such as the House Judiciary Committee, which has jurisdiction over patent law, or the House Energy and Commerce Committee, which oversees the Food and Drug Administration and works on many issues of critical importance to the industry, including drug regulation, research funding, and taxes on medical devices. 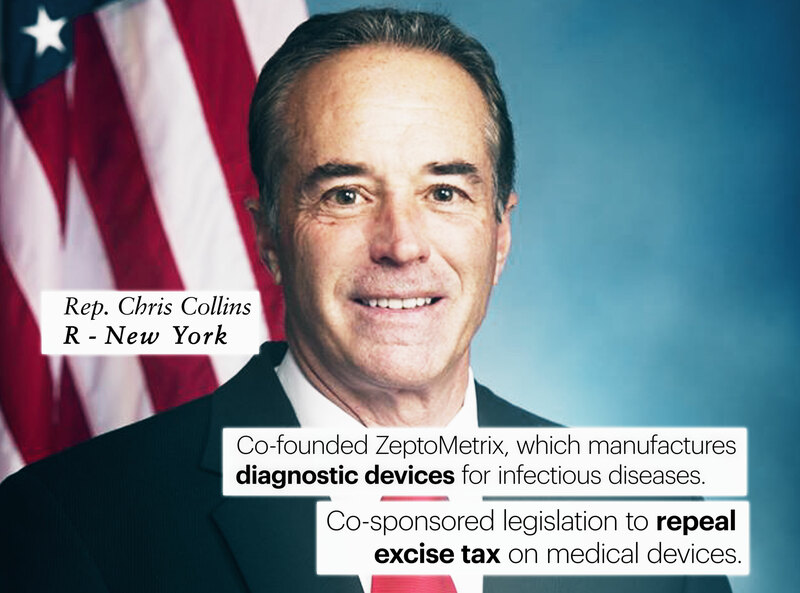 Collins, a Republican from western New York, sits on the Energy and Commerce Committee and co-sponsored a bill to repeal the tax on medical devices. That would help two companies in which he has invested heavily. He has also proposed pushing the FDA to loosen requirements for drug companies to track the safety and effectiveness of products after they’re on the market. That provision would help many pharmaceutical firms, including a biotech company in which Collins is the largest single stockholder. Two of Collins’ children also hold stock in the company, Innate Immunotherapeutics Ltd. — and Collins is a director. Innate Immunotherapeutics has noted the potential benefits of having a member of Congress invested in its success: It touts Collins’ status as a member of the Energy and Commerce committee in its annual report. Collins declined to talk to STAT about his investments. The STAT analysis, which drew on financial disclosure forms, found that he’s far from alone in potential conflicts of interest. 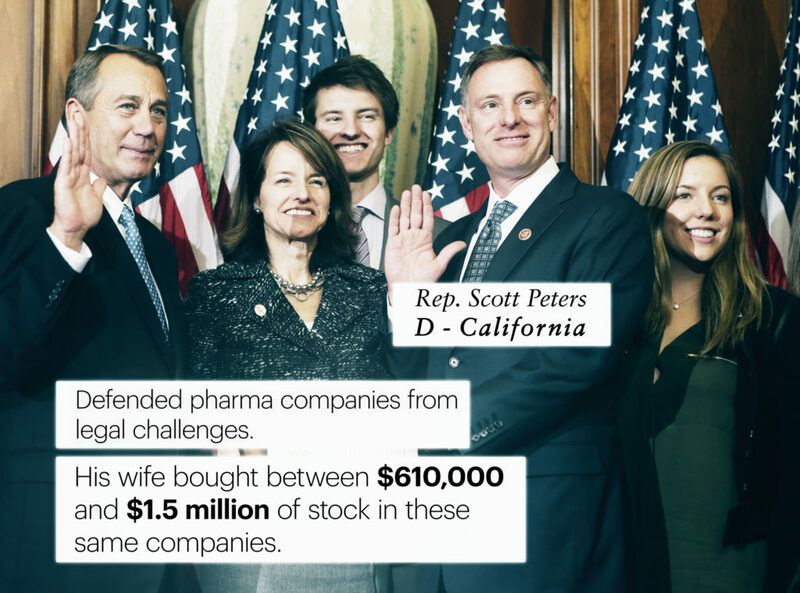 Representative Scott Peters, a California Democrat, this summer rallied 78 fellow members of Congress to protect pharmaceutical companies against costly legal challenges to their patents by opposing a bill known as the Innovation Act. The industry has made changes to the Innovation Act a top priority, saying it’s overly broad and would hurt legitimate inventors. It wasn’t unusual for Peters to back the industry. Biomedical companies in his San Diego district have named him “elected official of the year” two years running. But Peters also had a personal stake in the fight: His wife, Lynn Gorguze, was actively buying stock in various pharmaceutical and biomedical companies both before and after his July protest against the patent bill. 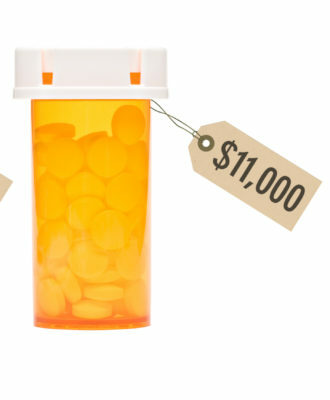 She bought between $610,000 and $1.5 million worth of stock in drug and device companies in 2015, including Allergan, Johnson & Johnson, Thermo Fisher Scientific, and Merck. Most belonged to the trade organizations that wanted Peters’ help on the patent bill. Those new assets are part of the couple’s large and diverse portfolio, worth at least $40 million last year. Members of Congress, of course, are constantly voting on bills that benefit one group or industry over another, because they feel it’s the right thing to do or in the best interest of their constituents. Government watchdogs, however, find the collisions between personal investments and political duties worrisome, not just in these cases but across Capitol Hill. 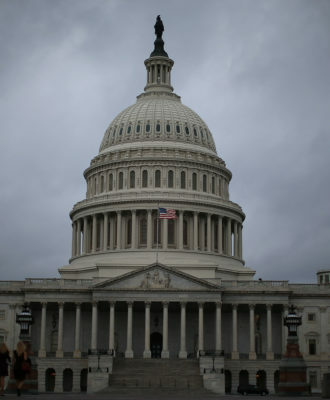 The fact that members of Congress hold stock in companies while “they are passing laws that affect those businesses is a particular area of concern,” said Dr. Michael Carome, director of Public Citizen’s Health Research Group, a nonprofit health advocacy organization. “Even if the lawmakers aren’t personally picking and choosing each stock, knowingly holding stocks in pharmaceutical and medical device companies creates obvious financial conflicts of interest,” Carome said. The STAT analysis found that some members of Congress do vote against their financial interests. For instance, Senator David Vitter (R-La.) this year introduced a bill that the drug industry has long opposed; it would let US consumers buy American-made medicines from Canada and other countries. 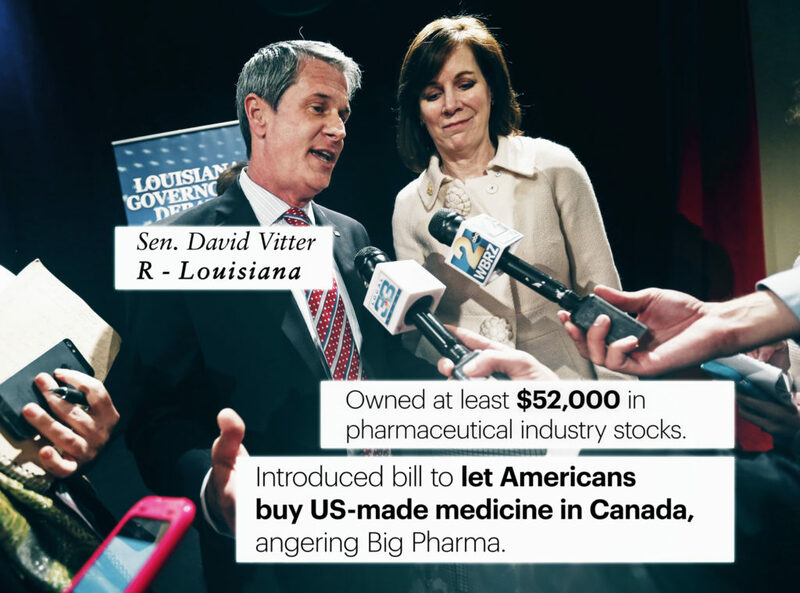 Vitter reported owning between $52,00 and $130,000 in pharmaceutical industry and related stocks at the end of 2014. In other cases, however, financial interest and political votes neatly align. Members of Congress are not required to recuse themselves from voting on bills that could affect their personal finances, unless they would be the primary beneficiary of the legislation. That’s unusual in D.C. Across most of the federal government, employees must recuse themselves from working on issues that could affect the value of their investments. The Department of Health and Human Services goes further, barring employees from owning stock in drug companies or other industries that the agency closely regulates. But the chief constraint on members of Congress is that they must report stock purchases and sales promptly — using ranges, rather than specific amounts, to describe the value. (A handful of lawmakers go beyond the rule and list the precise amounts.) That reporting requirement was enacted in 2012. Some said through spokespeople that they appoint managers or trustees to take care of day-to-day investment decisions. Most, however, retain the right to review their portfolio — or to make investment suggestions — at any time. Congressional rules actually require them to be informed of all purchases and sales unless they set up a qualified blind trust, which is rare, at least among the current crop of lawmakers. Robert Walker, a former chief counsel to both the Senate and House ethics committees, said lawmakers find blind trusts to be cumbersome, and not much of an insulation against conflict allegations. “The more practical approach is for members to be in mutual funds,” he said. Joseph Grundfest, a former commissioner with the Securities and Exchange Commission, agreed. STAT called dozens of lawmakers for this story. None would comment in detail on their investments. Collins’ life science portfolio is among the largest in Congress, according to STAT’s analysis. 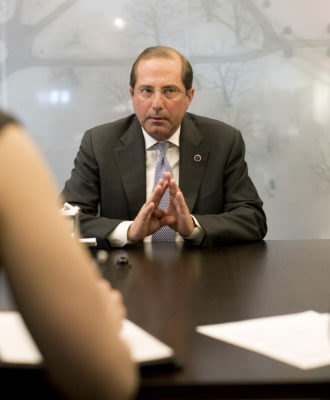 His seat on the House Energy and Commerce Committee gives him influence over food and drug regulation, biomedical research, and nearly every aspect of health law. When he came to Congress in 2013, Collins reported between $5 million and $25 million worth of holdings in ZeptoMetrix Corporation, the company he co-founded in Buffalo, N.Y. It focuses on products for diagnosing infectious diseases but also sells its products to hospitals and other research centers for what are called laboratory developed tests, which the FDA is moving to regulate — an effort which the company CEO Gregory Chiklis told STAT he opposes. Collins also owned between $500,000 and $1 million worth of stock in a medical device company, Chembio Diagnostics Systems, Inc., when he entered office. He has since made several large purchases and sales of Chembio stock. Also in Collins’ financial portfolio: Assets worth between $5 million and $25 million in Innate Immunotherapeutics, a biotech company based in Australia and New Zealand. 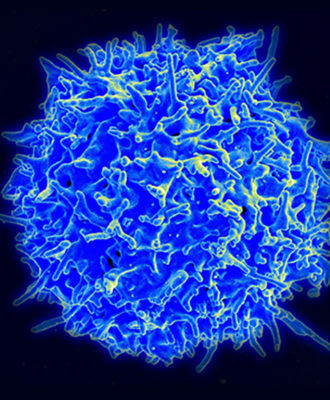 Although the company’s main focus is multiple sclerosis, its annual report notes that its American collaborators planned by the end of this year to open discussions with the FDA on using Innate’s drug as part of a new treatment for ovarian cancer. Innate is also part of the US Multiple Sclerosis Outcome Assessments Consortium, which includes regulators from FDA and other federal agencies. Collins is also a non-executive director of Innate; he attended 13 of the company’s board meetings in the fiscal year ending March 31, 2015. He does not get paid for his role as corporate director but has obtained additional stock options from the company in the past year, according to the company’s annual report. Last spring, Collins sponsored a provision in an FDA reform bill pushing the agency to reconsider its practice of requiring some drug companies to continue running studies to evaluate the safety and efficacy of medications after they hit the market. That provision would have benefitted Innate, among many other pharmaceutical companies. It did not make it into the final bill, called the 21st Century Cures Act, which is aimed at making it easier and quicker to get drugs and medical devices approved by the FDA. Collins and his staff did not return repeated calls and emails seeking comment. Multiple calls and emails to Innate were also not returned. Several of Collins’ colleagues on the Energy and Commerce Committee are also active investors in the biomedical sector. Representative David McKinley (R-WVa. ), for instance, joined a bipartisan stampede in July to pass the 21st Century Cures Act. Shortly after the bill passed, McKinley added a host of related stock to his diverse portfolio, including investments in pharmaceutical giant Amgen, medical device company C.R. Bard, Danaher Corp., and Thermo Fischer Scientific Inc. The investments totaled at least $125,000 and as much as $475,000. “Congressman McKinley does not actively manage his investments. His financial advisor manages his portfolio and has full discretion to make trades,” spokesman Mike Hamilton said. 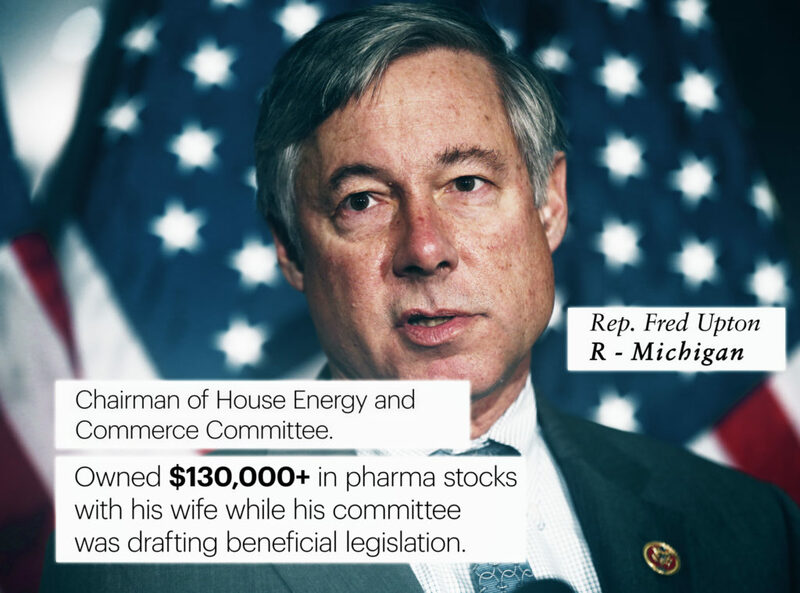 While the committee was working on the bill, Representative Fred Upton (R-Mich.), the committee chairman, invested at least $130,000 in health, biotech, and pharmaceutical companies with his wife. Some of the investments are in what Upton refers to as “trusts,” but they do not meet the congressional ethics standard for qualified blind trusts, and House ethics rules require Upton to be apprised of trades. Upton and his wife have substantial holdings in the sector, including investments worth between $50,000 and $100,000 each in Pfizer and in medical device company Halyard Health and between $15,000 and $50,000 each in drug manufacturers Bristol-Myers Squibb and Gilead. A spokesman said Upton believes in transparency about his investments. He declined to answer further questions. 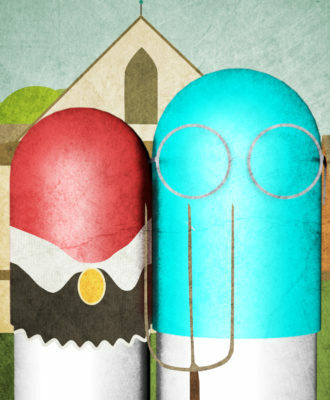 I agree pharma industry is changing with time .I am working in Biomorph life sciences which is a pcd Pharma company offering pharma franchise.for more into visit .www .pcdpharmacompanies.com. This is the reason behind Capitol Hill’s crusade on opiate pain meds. How many of these congressmen have holdings in the makers of Ultram, tramadol, ect.